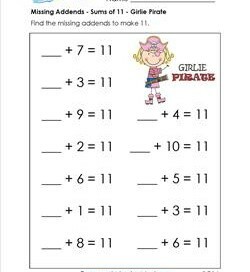 We have addition worksheets and activities for kindergarten and first grade at this time. All our materials for kindergarten go up to sums of 10. 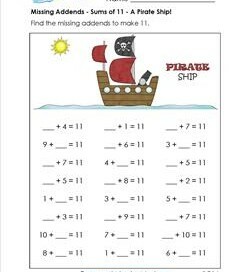 The first grade worksheets are missing addend worksheets for sums of 11-20. Kindergarten starts with adding with pictures and then children move on to adding with numbers. Our flash cards will be a great help. Spend the recommended 10 minutes per day using flash cards and before you know it you’ll be a pro! Go to this page in our bookstore to look at some books about addition to further complement your lessons. 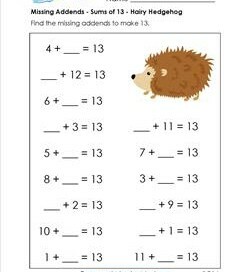 Go to this page to choose from all of the math resources on this site. Waving hello is this happy mate who wants to help fill in the missing addends! 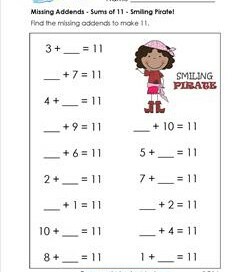 Once you’ve got the tens down you are on your way to mastering sums of 11. If you’ve never seen a true girlie pirate, well now you have. With telescope in hand she’s keeping her eye on you … making sure you fill in the missing addends. With eye patch, pirate hat, and torn pants, this pirate is ready to get rough and tough with you – helping you with missing addends with sums of 11! The black flag tells it all! It’s a pirate ship for sure. She’s out on the high seas all alone quite innocently bringing you 24 missing addends with sums of 11. 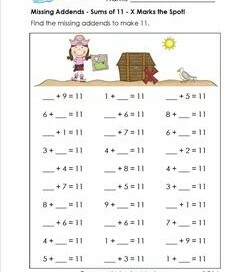 Missing Addends – Sums of 11 – X Marks the Spot! X marks the spot! The buried treasure has been found! 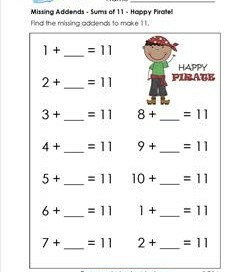 Aye matey, and you can make your own treasures by memorizing all the missing addends on this page. This busy bee is buzzing by keeping you as busy as he is. He’ll be pollinating the flowers and you’ll be filling in these 12 missing addends! If you like purple, you’re in luck! This beautiful butterfly is dropping in to see how you’re doing with filling in missing addends. 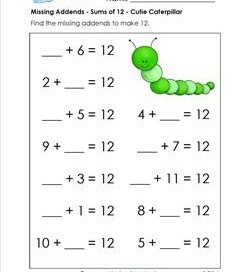 Just crawling along to spy on you, this cute little caterpillar has lots of hope that you’ll make him happy as you fill in these missing addends with sums of 12. 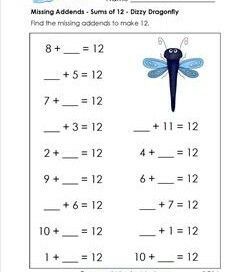 This dizzy dragonfly looks really silly and confused, but you’re mind is going to be crystal clear as you work on these 15 missing addends problems! Did you see that thing hop? 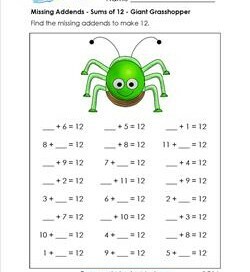 It was this giant grasshopper who just hopped onto this missing addends worksheet! Lovely indeed! 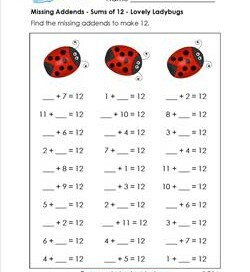 These ladybugs have it all, curly antennae, large black spots, and big eyes that will watch you until you finish all 30 missing addends. Hoppity, Hop! Hop! 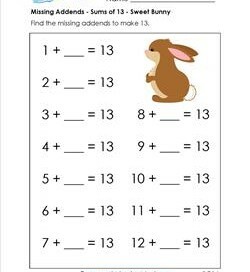 This sweet bunny will wiggle his nose as you wiggle your pencil to fill in these missing addends with sums of 13 worksheet! 12 problems. A sweet little deer looking so content and dreaming of frolicking in the forest. 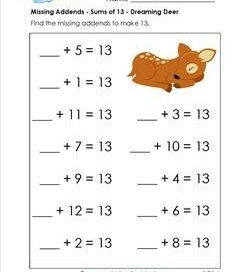 I’ll bet you dream about filling in missing addends … especially for sums of 13. This fine little fox is sitting up pretty and taking notice of you! 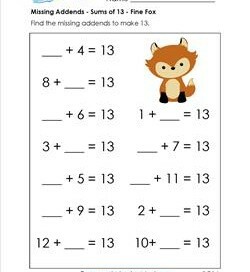 He’s gonna watch as you carefully figure out all twelve missing addends and write them neatly.